For a couple of hours, let’s forget the surrealist horror story that is our post-truth world. Instead, let’s go back to Colour Separation Overlay, Angel Delight for pudding and coats for goalposts as we return to the decade that taste forgot. Got your polyester flares and Six Million Dollar Man T-shirt on? Then settle back and listen to two new classic Doctor Adventures. Ah…..that’s better…. …The Transcendence of Ephros kicks off the second volume of Big Finish’s The Third Doctor Adventures, once more placing Tim Treloar’s spookily accurate impersonation of Jon Pertwee’s Doctor alongside Katy Manning’s Jo Grant. The story is set on the dying planet of Ephros, where Galactux Power Incorporated is exploiting its remaining resources, and perfectly encapsulates the best elements of those off-world and UNIT-free stories of the early seventies, as the Doctor and Jo use somebody else’s assumption of their identities to become entangled in a complex tale of intrigue and machinations. Another plot device familiar to Pertwee’s era is that of the religious group full of devout followers, and here we have a group of evangelical types ready and willing to accept death to transcend into an enlightened state. Bolstered by very strong direction and brilliant guest performances, The Transcendence of Ephros perfectly evokes the atmosphere of the non-UNIT Third Doctor era, with the Doctor acting as part action hero / part arbitrator, leading the charge and forging new allegiances as necessary. Jo gets to shine too, playing a more proactive role than usual as she bravely confronts a sinister foe who, in a way, acts as a mirror for herself. 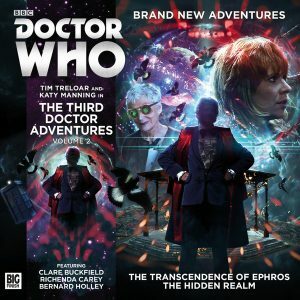 Tim Treloar continues to excel in Jon Pertwee’s iconic role, and ‘The Transcendence of Ephros’ unflinchingly delves into the past to offer a fascinatingly rich and rewarding tale. The Doctor and Jo return to Earth in The Hidden Realm, journeying to the village of Bramfield New Town to explore the mysterious disappearance of Pete, errant husband of one of Jo’s cousins. Our time travelling heroes soon discover that this is no simple disappearance, but involves a terrifying alien plot that reaches farther back into the village’s past than they’d ever anticipated. Like ‘The Avengers’ before it, seventies’ Doctor Who always did find remarkable success in subverting the sense of the familiar, and the cosy English village housing a dark secret is used to brilliant effect here. The writer brings Bramfield New Town to life, exploring both the physical landmarks and the characters in depth, and in doing so, building a powerful atmosphere and a menacing sense of foreboding that effectively drives events forward. The plot is simplistic, horrific and terrifyingly nascent, with the rich and powerful being given a second chance at the expense of ordinary citizens, and it’s Tim Treloar playing against character as a result of the Doctor’s arrogant vulnerability that is the highlight of the latter half of the story: having him play a darker take on the Doctor while remaining true to the essence of Jon Pertwee not only proves his versatility, but heightens the alien threat immensely.